Abstract: The Encyclopedia of Laser Physics and Technology has been started 5 years ago. It is time to look back and give an overview on the current situation. 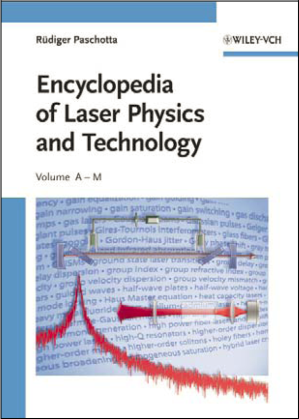 About 5 years ago, I have published the first version of the Encyclopedia of Laser Physics and Technology. So it is a good time to celebrate a jubilee. Many articles got a nicer structure – with sub-headings for easy finding of specific details. More figures have been added, and figures have been improved. 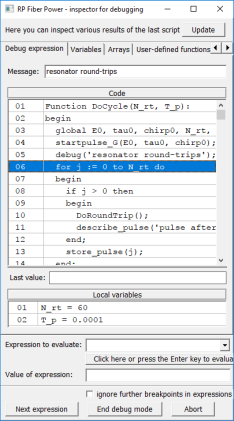 A lot of additional references to scientific articles and books have been added. The content is often updated, e.g. when new technologies become important. Each article is now grouped into one or more topical categories, making it easier to find more interesting materials on a specific subject area. You are very welcome to give your feedback, as this often helps to identify ways to make the work even more useful. A major event was the publication of the two-volume print version with Wiley in October 2008. This was of course an important driver for rapid further improvements: before one publishes such a work, one works very hard to get everything right. Certainly, the proof reading by a professional (a native speaker) helped to improve the language. Many figures have been improved by my wife Christine, who also did the layout of the print version and made the cover image. She did a wonderful job, and it is to a large extent her achievement that it is now really a nice experience to browse this book. One may wonder whether it makes sense to sell an encyclopedia in book form while offering essentially the same content for free on the Internet. I discussed this issue with Wiley, and we came to the conclusion that this should be tried. Of course, some readers will not spend the money for a book when they can have the content for free. However, quite a few customers see that differently. For example, libraries don't like to tell their users: we don't have it, just go away and use the Internet. (By the way, you may give your library a hint to get the book.) Also, group leaders in industry and university research can imagine that their staff is more likely to raise its competence level when the encyclopedia is available in book form, e.g. in the coffee area, inviting people to learn this and that. Naturally, many readers learn about this work only by finding the Internet version. In that way, the online version even helps the print version. The user community of the Encyclopedia of Laser Physics and Technology has become huge. 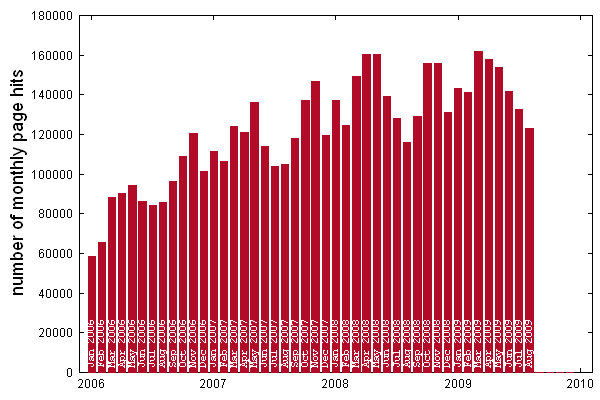 The graph below shows the evolution of the pagehit numbers since 2006. It happens now far above 100,000 times each month that someone loads a page. (Search engine spiders are not included in the numbers.) Such numbers are of course absolutely unusual for a small company. The main reasons of the large usage numbers are probably the regularly returning visitors (using the encyclopedia as the first address when searching for certain information) and the high ranking in results pages of the major search engine, in particular Google. The latter is really amazing. When one types the heading of an arbitrary article into Google, in roughly 70% of the cases the encyclopedia article will appear among the first three results. So Google is in line with many users, supporting the view that this work is often the best to get something on these topics. As no registration is required, it is difficult to tell how exactly the user community looks like. Nevertheless, it is quite clear that it mostly consists of (a) industry people and (b) researchers. There is probably only a small number of hobbyists, as the technical level is fitted to the needs of those people who quite actively work with laser technology. The server statistics also deliver evidence for that. For example, pagehit numbers tend to drop during major international conferences and exhibitions such as Photonics West, apparently because these make those people busy who would normally use the encyclopedia. The times for summer and Christmas holidays are also regularly more quiet. Good business actions are those who bring benefits for a wide range of people. The Encyclopedia of Laser Physics and Technology serves many people both in industry and research, and quite a few have expressed their gratitude. I am glad to see that the encyclopedia is widely recognized as a valuable service to the laser and optics community, and particularly happy to know that researchers in third-world countries profit, who don't have access to large libraries and expensive books. Of course, RP Photonics Consulting itself profits a lot. Most of the consulting customers originally got into contact with the company after reading in the encyclopedia and realizing that the person behind it could offer even much more important benefits for their business. The encyclopedia has also been recognized as a good tool for advertising. Vendor links allow to make readers of very specific articles aware of certain products, and are thus an extremely efficient way of reaching exactly those who need certain goods. Banners, appearing on the right side of all encyclopedia pages, receive very high numbers of pagehits and are thus useful for branding, also for announcing new products with high sales potential. For RP Photonics, this generates additional turnover which partly compensates the huge effort invested into this work. So the advertising customers may also been seen as sponsors for something which benefits many people.